Is PM Modi really a ‘Champion of the Earth’? The United Nations Environment Programme (UNEP) has selected Prime Minister Narendra Modi and French President Emmanuel Macron for this year's “Champions of the Earth” award—the UN's highest environmental honour. Both have been selected in the "Policy Leadership" category for their pioneering work in championing the International Solar Alliance and promoting new areas of levels of cooperation on environmental action. However, is the Prime Minister really deserving of such an honour, critics might ask. Throughout his regime of 4 years and 4 months, his ministers have diluted laws without public consultation, undermined institutions and tried everything in their power to make it easier for corporates to exploit natural resources ranging from forests, wildlife, coasts and made the air pollution and waste scenario worse. Also during that year, the Modi government formed a high-level committee led by former cabinet secretary T S R Subramanian to “review and suggest amendments” in the six main environmental laws of the country—Environment (Protection) Act, 1986; Forest (Conservation) Act, 1980; Wildlife (Protection) Act, 1972; Water (Prevention and Control of Pollution) Act, 1974; Air (Prevention and Control of Pollution) Act, 1981; and Indian Forest Act 1927. Due to intense opposition to the committee’s findings, the government never implemented them fully. The Modi government’s “dilution spree” of laws pertaining to India’s forests, coasts, wildlife, air and waste has continued this year. In October 2017, the Centre finalised the third National Wildlife Action Plan (2017-31) of India. 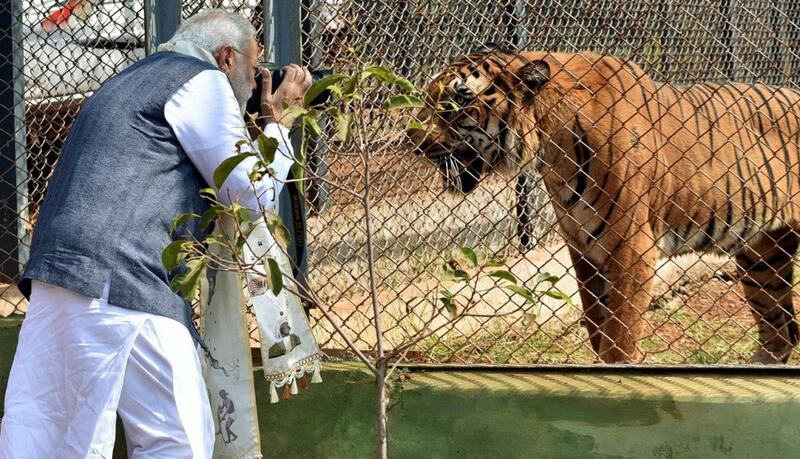 However, the state of wildlife protection during the Modi regime has been lacklustre. A recent piece in the data news portal IndiaSpend detailed how the regime has made awarding wildlife clearances easier in its more than 4-year stint and how corporate interests now threaten some of India’s last protected wilderness areas. Ditto for forests and coasts. In March this year, the Union Ministry of Environment, Forest and Climate Change (MoEF&CC) proposed major changes to the draft National Forest Policy (NFP) 2018. The draft has been criticised for favouring corporate interests in the forestry sector. In April this year, the MoEF&CC made public the draft CRZ notification 2018. Critics say that the draft will open up India’s coasts to industry and help in aiding the government’s ambitious Sagarmala programme. Also in April, the government unveiled another troubling scheme, the National Clean Air Programme (NCAP), to tackle toxic levels of air pollution across most major Indian cities, as well as rural areas. Experts say that the proposal is a toothless and directionless plan as it sets no targets for reducing pollution from cities. Again, in the same month, the MoEF&CC notified the new Plastic Waste Management (Amendment) Rules, 2018. The new rules, an amended version of the environment-friendly Plastic Waste Management Rules 2016, contain new clauses that benefit industries manufacturing and using plastic. Besides diluting laws, the government is also weakening institutions. For instance, the Union Ministry of Tribal Affairs has pointed out that its authority as the nodal agency for the Forest Rights Act (2006), has been diluted by unilateral policy decisions and enactments proposed by the MoEF&CC without any consultation with it. In 2014, the Modi government had constituted the National Board for Wildlife (NBWL) without the required number of non-profit representatives and eminent ecologists as its members. The government’s move was challenged in court, and it was subsequently forced to reconstitute the NBWL with the required number of experts. Last year, the Modi government had disempowered the National Green Tribunal (NGT). The NGT, which was set up by the Congress-led UPA government in 2010 to adjudicate on environmental litigations, was the third such tribunal in the world after Australia and New Zealand. However, instead of empowering the NGT, the Modi government misused the provision of a "money bill” to make changes to the appointment system of judges to the NGT. However, the Supreme Court subsequently stayed the government’s amendment to NGT appointment rules. The government’s policies have taken their toll. For instance, India stands 177 (out of 180 countries) on the Environmental Performance Index, 2018. In 2016, India was ranked 141 on the same index. India also has the dubious distinction of having the maximum number of environmental conflicts in the world, with the Environmental Justice Atlas (an international database) recording 271 cases in India in 2017. Moreover, in 2013, India had six out of the top 10 most polluted cities in the world. Today, we have 11 out of the top 12. Should we really be celebrating the Prime Minister’s selection? Food for thought. Today media or organisation have biggest problem is ignorance and misunderstanding either they have Indian economy knowledge or environmental knowledge.India import 7 lakh crore worth crude oil from Gulf countries every year and India producing 100 GW of power from coal based power plant.This destroyed Indian economy and environment for this only solution is renewable energy and electric vehicle. Modi doing same he increased solar and wind power and promoting Electric vehicle.He making structural reform. This is clearly a biased article..this shows how much these urban naxals hate Modi...and such articles definitely prove that Modi is doing something very right! !..we love this greatest leader of our country. Reduction of Grassland and Paddy Fields and Arabica Coffee and other Shade Demanding Plantation Crops. Unprecedented Loss of Forest Cover through Timbering and Logging. The real Forest areas need a relook now in 2018. A revised Prof Madhav Gadgil Report. The Original Rich Forest Zones in the W.G. have been stripped and literally raped beyond recognition. 60 % of the Western Ghats in Karnataka are rich in Biodiversity and were given the Heritage Tag by UNESCO . Many Political and official lobbies have opposed this precious tag and even managed to overcome the hurdles despite strong voices of Support from Environmentalists. In fact the S.W Monsoons owe their origin to the W.G. Rain patterns are already quite erratic and many more Calamities are just waiting to happen and disturbed nature is just waiting to thrust these upon Man and Beast. Unfortunately neither Flora nor Fauna NOR Beast can undo the damage and MAN and ONLY MAN can do it but ONLY through total concerted sincere effort. True forest itself diluted .Before 1970 India had biodiversity rich country.Now all our natural forest covered with commercial trees coconut, Rubber,cashew nut,coco,acacia,eucalyptus,silver oak,tea and coffe plants.whatever tree we can grow maximum 10 to 15 variety trees.But Indian forest had 50000 variety of trees.It is very difficult to grow this much variety trees.it is the responsibility of 130 crores people to protect Indian forest. Even Coconut Trees are being Considered as Grass and have been decimated. The People especially the Tribals who are the real protectors of the Forests , BUT have no powers and in the name of Development the little remaining Forests are being cut on one side and Timbering and Logging encouraged and the Mangroves being reduced to nothing and Sand Mining rampant on the Sea & River Beds . This is the root cause of Floods and Calamities in various regions of the country. The recent Floods in Kerala & Kodagu are a fit case. The writer conviniently forgetting PM Modi's Swachchata abhiyan (keep clean the places) and giving millions of gas cylinders who otherwise use wood for cooking. How much wood is saved?how much smoke and pollution prevented? This article should be directly addressed to the UNEP. They need to know ground realities and reply back. Is it based on facts and reality or blah blah and made up facts? These journalists have become their own judges. Is their any statement that is factual. all article is based on so called views of experts whose names and their credentials havent been quoted anywhere . These Journalists with no scholarship in environment protectionism have become champions of earth. Rather the UN should award these journalists for protecting earth by writing malicious article. I'm definitely sure you will not publish these comment.. But it is the negative media like you who speak two sides.. Today our international relations are at peak of the millennium.. Some international body is recognizing him and I'm sure they are not dumb enough that without any criteria they are providing these award...UPA might have created laws but what about their implementations.. Making law and Giving land to vadra?.. Making law and the finance minister P. Chidambaram calling the bank officials not to enquire vijay malya.. Shame on you.. If you are an constructive and positive media then provide your suggestions to the PM.. spread some kind of positivity.. The writer seems to be more intelligent and knowledable thsn the collective wisdom of UN. Good luck to the writer.